Like it or not, the time to start planning Christmas gifts is nigh! Over time, it can become more and more difficult to find a truly spectacular gift, especially if we’ve exhausted all our best ideas in previous years. This year, why not get extra thoughtful and make homemade gifts to show loved ones how much you care? 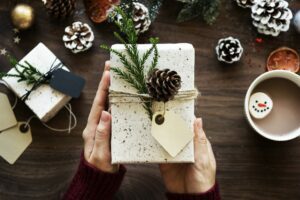 Homemade gifts give you the opportunity to customise a prezzie to the recipient’s particular tastes, making them unique. Additionally, making things at home can save money, particularly if you’re preparing something in bulk to give to several people. For Christmas 2018, we’ve come up with a few ideas for homemade gifts your loved ones will treasure. This is a great gift idea for a homemaker, but best given before Christmas as it’s particularly festive. Christmas is an assault on the senses, and festive aromas wafting through the house is so inviting. This is why we’re making stove-top pot pourri! There are lots of recipes you can simmer on your stove-top to fill your home with fabulous scents. You can create scent kits and gift them to friends and family. Purchase some festive cellophane gift bags – the ones used for cookies at Christmas will be fine. In each, pack some dried orange slices, cinnamon sticks, cloves, star anise and rosemary. Tie the bags closed with some pretty ribbon, poking a candy cane through the loop as an added treat. In your fanciest hand write instructions on a label you’ll attach to the ribbon. Explain that the kit is to create amazing, seasonal scents to drift around the home, and just to pop the contents into a pot, add several pints of water and leave on a low heat all day. Recommend they don’t use their best pan! People always need soap, right? This is a great gift to make in bulk, because it’s cheap to make and will appeal to so many people. The scents are also completely customisable, so you can either make gift sets, or a special scent for each recipient! Scent – use powdered spice mixes, essential oils etc. Slice the soap base into cubes, place them inside the measuring jug and melt in the microwave in twenty-second increments until it is completely melted. Stir frequently. When melted, add your scent. Our favourite blend is a pumpkin pie soap made with powdered pumpkin pie spice mix. We stir in two tablespoons of this. For peppermint soap, we stir in one teaspoon of peppermint essential oil. Stir in few drops of colourant (use several drops for each colour if you’re using more than one. Once the mould is almost full, you can create patterns in the soap by dropping in colour on top of the setting mix and making shapes with a cocktail stick. Soap colourant is designed not to come off on skin, so don’t worry about turning your loved ones into Smurfs! Pour the melted soap into the soap mould, and allow to sit undisturbed until cool (about 30 minutes or so). Remove and enjoy! These make brilliant gifts; all the fun of decorating a house without any of the mess of baking it! You’ll need to purchase gingerbread house cookie cutters, and per kit, you’ll need a plastic squeeze bottle with a nozzle, festive cellophane bags, a basket or plastic container larger enough to hold the kit, sweets and chocolate to decorate the houses, ribbon, and enough card to write out instructions for assembly. Follow this recipe, adjusting the amount of ingredients depending on how many kits you’re making. Once the gingerbread is cool, stack the pieces needed for each house and tie with ribbon. Follow these instructions for making Royal icing, and once prepared, pour into the squeeze bottle(s). Fill the cellophane bags with the sweet decorations, and arrange all the ingredients for the house in the box. Feel free to add a festive touch; some tinsel, a few baubles, some fake snow, and close the lid. A hot bath is one of the most restorative things to enjoy when the whether is cold or we’re feeling a little run down. Did you know that Cleopatra claimed that a milk bath preserved her beauty and kept her skin glowing and youthful?! Milk baths leave the skin feelings supple, smooth, and hydrated, they reduce stress and can even soothe mild skin complaints. There needn’t be any fancy ingredients costing the Earth; you may even have all you need right now! A peppermint milk bath is our festive twist on an ancient beauty routine. The only ingredients you need are 200g of whole powdered milk (the higher the fat content the better) and either four teaspoons of peppermint tea or ten drops of peppermint essential oil. Combine the ingredients in a bowl and whisk together. After that, store the mixture in a cool, dark place in a sealed container to allow the peppermint to infuse. You only need a small amount to enjoy the benefits in the bath, so we recommend spooning some mixture into plastic test tubes with lids and sealing them. You can tie ribbons around these and attach small decorations, sweet treats or Christmas flora and fauna. The only thing you must affix is instructions! Write a label instructing the recipient to pour the milk bath under hot running water before lying back and relaxing! We hope you enjoy the deep sense of satisfaction that comes with creating something special from scratch. Do you have presents that you make for loved ones each year?